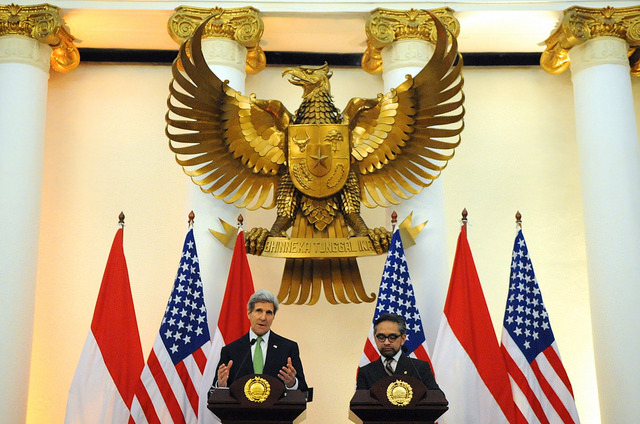 The United States has thus far avoided getting publicly involved in the Indonesia–Australia spying row; however, it can’t afford to do so any longer. Australia has demonstrated a naiveté in thinking that public diplomacy rows such as this can be settled using traditional ‘cocktail diplomacy’. Likewise, its apathy to public diplomacy on social media may be indicative of an inability to plan and conduct strategic communications campaigns. Indonesia is home to 50 million Facebook users, 35 million Twitter users and a projected 42% social media penetration of the population by 2017 . As broadband internet access penetrates further into rural Indonesia, US–Allied strategic communications and public diplomacy are only going to grow in complexity and importance. ‘Cocktail diplomacy is dead,’ reads the simple Facebook post from retired Admiral James Stavridis after attending the World Economic Forum at Davos, Switzerland. Indeed, as information technology continues to mature and proliferate across the globe, public diplomacy via social media will be increasingly important as citizens become more aware of international politics and attempt to shape policy by exerting influence over their respective leaders. Nowhere does this statement resonate more profoundly than in the current Australia–Indonesia row. Following the Snowden revelations, Indonesia’s highly socially networked population took to Twitter, Facebook and the blogosphere to denounce the Australian spying. While Indonesia’s government tried to get ahead of the popular outrage and launched its own statements on social media , Australia maintained silence on its official Twitter/Facebook accounts, promising only to send a formal démarche within a week. This thumb in the eye of public diplomacy in favor of more traditional ‘cocktail diplomacy’ did nothing to assuage the growing outrage and resulted in Indonesia’s suspension of elements of the Lombok Treaty such as coordination of counter human-trafficking operations, leading to confusion, misunderstanding, accusations of violations of sovereignty/territorial waters, increased military patrols/redeployments and an escalating war of words both at the civilian and military levels. The Lombok Treaty has been the modern foot in the door for US–Australia–Indonesian Theater Security Cooperation (TSC) missions. Recent changes to Australian security policy in the past years have generated apprehension in Indonesia. For example, the establishment of a permanent US Special Purpose Marine Air Ground Task Force (SP MAGTF) in Darwin led Indonesian Foreign Minister Marty Natalegawa to rebuke it as ‘…a reaction to the rise of China’ and ‘capable of generating a vicious cycle of tension and mistrust.’ Tensions due to the ongoing spying row will only make it harder to sell both the SP MAGTF deployment to the Indonesians as a force for regional stability / security and the perception that US-Australian-Indonesian tri-lateral relationship is mutually beneficial (not conspiratorial against the Indonesians). China has proven to be adept at generating and exploiting regional tensions—especially when western powers are involved—by presenting itself as a sympathetic Asian neighbor. The curious simultaneity of the People’s Liberation Army Air Force announcing the creation of the Air Defense Interrogation Zone (ADIZ) and Edward Snowden’s releasing of his files detailing the Australian SIGINT operations against Indonesia point towards a potential Chinese plot to undermine the Lombok Treaty. If China chose to ingratiate itself with Indonesia, it would have a good basis to start from. Annual Chinese trade with Indonesia (US$66bn) triples US trade (US$22bn). The minority Chinese diaspora population controls over 73% of publicly traded companies within Indonesia  and are critical to brokering the PRC financing of infrastructure projects such as roads and broadband internet. By comparison, US Agency for International Development (USAID) assistance only accounts for a trifle $166m . According to a 2013 Pew Research survey, Indonesians view China as more of a partner than the United States (53%-46%). That’s surprising, given Indonesia’s history of anti-Chinese sentiment . …synchronization of our words and deeds as well as deliberate efforts to communicate and engage with intended audiences via public affairs, public diplomacy, and information operations (condensed 2010 USG definition). Given the demonstrated influence of the socially networked and internet savvy Indonesian public, as well as their economic reliance on China and Chinese industry, it’s essential that the US and Australian governments engage in a joint strategic communications social media campaign targeting the Indonesian people to change their attitudes on both the spying row as well as the basing of the SP MAGTF in Darwin. The failure to effectively communicate with the Indonesian people could result in stronger, mutually-exclusive, bilateral relationship between China and Indonesia, at the expense of western nations. Nicolas di Leonardo is a member of the Expeditionary Warfare Division on the staff of the US Chief of Naval Operations, as well as a graduate student of the US Naval War College. The views presented here are his own and do not necessarily represent the official positions of the United States Navy or the US Naval War College. Image courtesy of Flickr user US Department of State .